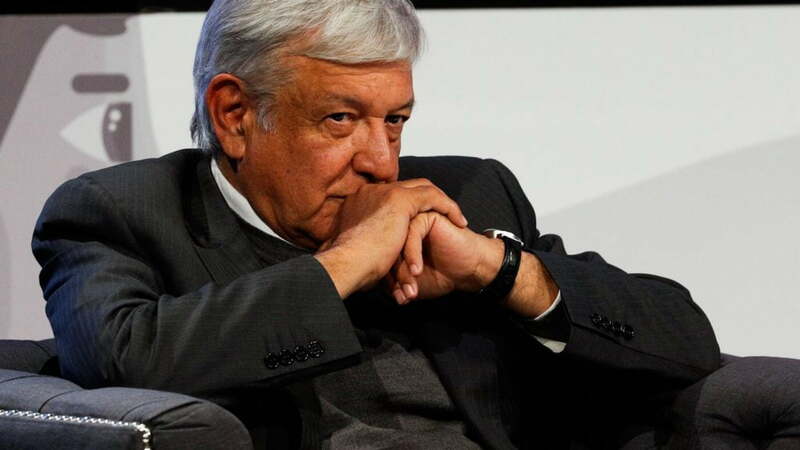 International capital is worried and the world is hopeful as Mexico is ready to buck an international right-wing tide, shifting its government from right to left-of-center with the presidential inauguration of Andrés Manuel López Obrador (AMLO) on December 1. The full quote by Porfirio Díaz is: “Poor Mexico, so far from God and so close to the United States.” Mexican President Díaz (1876-1880 and 1884-1911) got it at least half right. Mexico has suffered in the shadow of the Colossus of the North, but Mexico is not poor. Mexico is rich in many ways, yet it also has been impoverished. And Mexico has been greatly underappreciated by North Americans. Mexico is bucking an international right-wing tide, shifting its government from right to left-of-center with the presidential inauguration of Andrés Manuel López Obrador (AMLO) on December 1. Speaking for international capital, The Economist is worried. The other 99% of humanity is hopeful. A cautionary history of this trice conquered land follows. Prior to Europeans “discovering” the New World, Mexico was home to many great civilizations, which thrived for nearly four millennia: Aztec, Huastec, Izapa, Maya, Mixtec, Olmec, Purépecha, Teotihuacan, Toltec, Totonac, and Zapotec. History and Headlines rates the “10 great historical civilizations,” naming the Olmecs and Aztecs alongside the Romans, Persians, and Egyptians. The popular image of the Aztec depicts savage men in loin clothes and feathers on top of stone pyramids making human sacrifices. But let’s put that into historical context. Historian James Cockcroft tells us that at the same time the barbarians in the New World were assuaging their pagan gods with human blood, more people met their end burned at the stake as “witches” by the civilized Europeans in the name of Jesus. Christian femicide is a forgotten legacy. European contact in 1519 brought Christianity and disease to the then flourishing Mexican civilizations. While the Europeans and the indigenous Americans were roughly on the par technologically, the Europeans were far more adept at war and to them went victory and the spoils. Geographer Jared Diamond estimates that 90% of the Native American population was obliterated by measles, small pox, flu, and the like for which the Europeans had developed relative immunities. Mexico did not regain its 1519 population until 1940, taking over 400 years to recover. Although the official language of Mexico is now Spanish and Mexico is the most populous Spanish speaking nation in the world, it is also home to the largest number of actively spoken indigenous languages in North America. The first conquest of Mexico was by the Spanish conquistadores. The second was by the Yankees and has received far less acknowledgment. The Adams–Onís Treaty of 1819 established the border between the former Spanish colonial territories and the former British colony, now the US. By 1836, the Republic of Texas succeeded from Mexico and was annexed to the US in 1845. The following year, the Mexican-American War was provoked by the US as a war of conquest. Two years later, Mexico was forced to sign the Treaty of Guadalupe Hidalgo ceding nearly half its national territory. The US gained what would become parts or all of California, Arizona, Nevada, Utah, New Mexico, Wyoming, and Colorado. The Gadsden Purchase of 1853 added southern Arizona and New Mexico to the spoils of war. Gold had been discovered at Sutter’s Mill just a few days before the treaty was signed, which transferred Alta (upper) California from Mexico to the US. The discovery of gold was unknown to the signatories at the time. Alta California was to become the Golden State. With a $2.7 trillion economy, the state now boasts the world’s fifth largest economy, larger than Mexico’s $2.4 trillion gross domestic product (GDP). Were Alta California to rejoin Mexico, the new union’s GDP would be surpassed only by the mega-economies of China, US, India, and Japan. The constitution for Alta California was drafted in both Spanish and English. Despite having a bilingual constitution, the Alta California voters passed the English-only Proposition 227 in 1998. Then in 2016, the voters passed Proposition 57, which repealed the more egregious English-only provisions of the earlier proposition. The bully to the north became revolution-adverse after concluding its own revolution. When Haiti won its independence from France in 1804, the US joined Napoleon’s empire to force the fledgling Haitian nation to pay debilitating reparations for freeing itself from slavery. Nevertheless, the Mexican Revolution of 1910-20 was able to slip by. In those days the US empire was not as capable at multitasking as it is now and was preoccupied by World War I. The Mexican Revolution stands in the pantheon of great 20th century revolutions, pioneering the way for Russia (1917), China (1949), Vietnam (1975), and the many Third World liberation struggles of the last century. As the first of the major 20th-century revolutions, the Mexican Revolution guaranteed labor rights, nationalized subsoil rights, secularized the state and curbed the power of the Roman Catholic Church, and gave inalienable land rights to indigenous communities. Women’s rights were advanced, and women fought as soldiers and even commanders in General Emilio Zapata’s revolutionary army. Many of these gains have since been eroded. After the tumultuous revolutionary period, politics in Mexico became consolidated under the PRI (Institutional Revolutionary Party). This single corporatist party brought together political factions representing the peasantry, labor, and urban professionals. As the revolutionary period receded, the PRI became politically centrist. The one-party rule of the PRI was finally ended with the successful presidential election in 2000 of Coca-Cola executive Vincente Fox of the PAN (National Action Party). The PAN won the subsequent presidential election as well. The PAN is a right-of-center Christian democratic party. It has strong backing among northern Mexican agri-business and international corporations and has a conservative social agenda. The current Mexican president, Peña Nieto, is a member of the PRI. As the PRI moved to the right, more liberal forces within split in 1986 and formed the PRD (Party of the Democratic Revolution). The main stronghold of the PRD has been Mexico City and among organized labor. Andrés Manuel López Obrador was the PRD standard bearer in the 2006 and 2012 presidential elections. His losses in both elections are widely believed to be due to fraud. The third conquest of Mexico was by North American finance capital came in the form of the North American Free Trade Agreement (NAFTA) and similar neoliberal arrangements. Neither free nor restricted to trade (e.g., it includes military cooperation), this stealth conquest facilitated the repatriation of foreign investment profits and the further integration of Mexico into the US economy. NAFTA was ratified in 1994 among Mexico, the US, and Canada. The agreement remains controversial in the constituent counties. The Zapatistas in southern Mexico specifically chose the initiation date of their on-going rebellion to coincide with the day NAFTA started, presciently predicting the deleterious effects NAFTA would have. By 2014, as many as a million US workers had lost their jobs due to NAFTA, which also had the effect of depressing wages. NAFTA ended many Mexican government supports for agriculture, while encouraging the entry of US and Canadian agricultural products. Consequently, peasant and most family farm agriculture in Mexico are less economically viable. The result has been a massive internal migration from the countryside into Mexican cities and an external emigration of people forced off the land to the US. A decade or two before the imposition of NAFTA, Mexico had appeared poised to transform from a developing to a developed country. New oil reserves had been discovered and a boom seemed imminent. Then instead of continuing a development model, Mexico bowed to international financial pressure and switched to a neoliberal model of deregulation and privatization. Rather than lifting Mexico’s economy through its deeper integration with the US economy, as NAFTA’s proponents promised, Mexico has fallen even further behind. After NAFTA and the neoliberal “reforms,” poverty went up in Mexico while per capita economic growth lagged compared to the rest of Latin America. Instead of wages becoming like those in the US, working wages became competitive with Guatemala. Mexico took its place in the international market economy as an export platform for low-wage maquiladoras, factories owned by foreigners and exporting to a foreign market. Despite great national wealth, 46% of Mexicans live below the poverty line. The per capita income of Mexico is a third of the US, making the shared border the most income-unequal border in the world. Neoliberalism has also had its winners. The government telephone monopoly Telmex was privatized in 1990, bought up by Carlos Slim Helú who became the richest man not only in Mexico but in the entire world by 2010. His ranking has now slipped to seventh, though he is still the top tycoon in Mexico owning 40% of the listings on the Mexican stock exchange. His net worth is equivalent to 6% of Mexico’s GDP, which is greater than the entire GDP of neighboring Guatemala and four times that of Nicaragua. With a new strata of billionaires and deepening poverty, both spawned by neoliberalism, Mexico is among the more income unequal nations, with a Gini Index of 48.2. Carlos Slim and eight other international fat cats now have more wealth than half the world’s population. Yet today Mexico as a nation is rich in many ways. In terms of biodiversity, Mexico is way under-recognized. Mexico ranks fourth or fifth in the world, scoring high for the number of reptiles, birds, mammals, and plants. The much more celebrated Costa Rica in comparison doesn’t make the top ten in any of these categories, although it has a far better public relations apparatus. Mexico encompasses vast rainforests, dry forests, mountains, deserts, and the second largest coral reef in the world. In terms of conservation, Mexico has been a world leader in the protection of whales. Commercial whaling was banned in 1954. In contrast, the last US whaling station in the San Francisco Bay was closed in 1971, followed the next year by passage of the Mammal Protection Act. The world’s first whale refuge was established in 1972 by the Mexican government. In 2002, Mexico again exercised world leadership in designating all its territorial waters and Economic Exclusion Zones as whale refuges. Culinarily, Mexico’s cocina is considered among the great cuisines of the world; a lot more than taco trucks and cheap burrito stands. Amongst Mexico’s contributions to the world’s larder are avocado, chocolate, guava, tomato, vanilla, many varieties of beans and chiles, and most notably corn, which is now the world’s most important staple food. Mexico has the most UNESCO World Heritage Sites in the hemisphere. The three most influential modern muralists are the Mexicans Diego Rivera, José Clemente Orozco, and David Siqueiros. With 7.6 billion bbl of proven reserves, Mexico is a major crude oil producer. Ranking 12th in the world, it outproduces Nigeria, Qatar, and Libya. Mexico’s economy ranks 11th in the world, placing it second in Latin America after Brazil. Mexico’s GDP is greater than that of Italy or Spain and just below France and the UK, making it one of the world’s economic powerhouses. Left-of-center Andrés Manuel López Obrador ran for the Mexican presidency on July 1. Having broken from the PRD, this third run was the charm as he won decisively. Morena, his newly formed party, swept the national and state legislatures. Mayor-elect of Mexico City, Claudia Sheinbaum Pardo, is also part of the winning coalition. She is the first woman and first Jew to be elected to the post. She is a scientist and was a joint winner of the 2007 Noble Peace Prize as a member of the Intergovernmental Panel on Climate Change. After decades of right-wing governments in Mexico, López Obrador is being sworn in on December 1. The popular sectors in Mexico are expectant that corruption, inequality, and other long-festering economic injustices will be addressed. Roger Harris is the immediate past president of the Task Force on the Americas (http://taskforceamericas.org/), a 32-year-old human rights organization, and is active with the Campaign to End US-Canadian Sanctions Against Venezuela (https://tinyurl.com/yd4ptxkx).